Scientists at the USDA are conducting a second year of the “Great Stink Bug Count” and are looking for volunteers from NJ! They are trying to identify characteristics of houses that brown marmorated stink bugs look for when finding overwintering sites. Last year’s count had over 200 volunteers with 44 individuals who counted every day. Consider participating in the 2014 Great Stink Bug Count! Results from 2013 are the first to document factors that may be important in where bugs chose to overwinter. 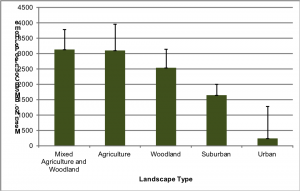 Last year’s results suggest that landscape factors, specifically agriculture and woodland habitats, may have the greatest influence on the number of BMSB overwintering on a house. This data will go a long way to helping us figure out important steps to managing BMSB. They are looking for citizen scientists to help out! Please fill out the attached form and send it in if you are interested!